Feast on our sumptuous selection of chocolate petits fours which will satisfy even the most discerning chocolate lovers palette! A sumptuous selection of our best chocolate petits fours which will satisfy even the most discerning chocolate lover. Savor these out of the ordinary tender bite-sized cakes with your favorite coffee blend or espresso. 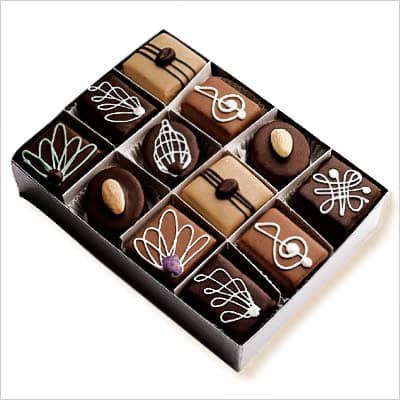 Assortment includes: robust Triple Chocolate, Mocha Bean, Almond, Truffle, Hazelnut and creamy Milk Chocolate. No extra shipping on two boxes going to the same address. So buy more and save on shipping.